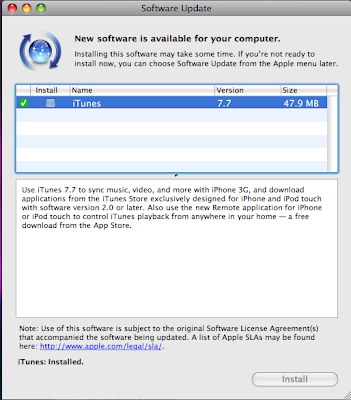 iTunes 7.7 is now available for download on Mac OS Software Update. The actual version number is 7.7 (43). It is not available for Windows yet. This update is the first step to installing or upgrading the new Apple iPhone Software from 1.1.4 to the new Apple iPhone Software 2.0 on July 11, 2008. If you are planning on upgrading to the new iPhone 3G, I would make sure you backup and synchronize your iPhone prior to upgrading. That said, it is possible that your phone can become locked or damaged during the upgrade process and if you are not technical, you might want to wait for several weeks to put on the upgrade since the Apple Stores and AppleCare Telephone Technical Support wil be very busy on and after the July 11, 2008 iPhone 3G launch. 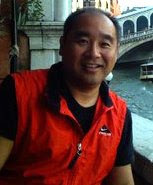 See this link from the Apple website for more info on upgrading to the iPhone 3G.